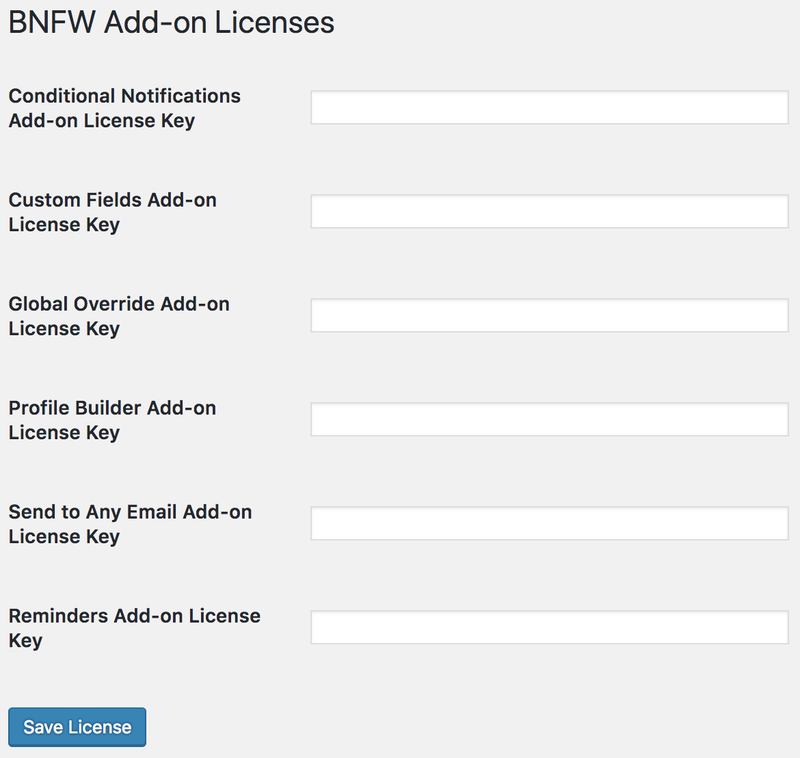 The add-on licenses screen allows you to add and activate the license keys for any BNFW add-ons that you have purchased or have a subscription for. Once you have installed and activated an add-on in the Plugins > Add New screen in the WordPress Admin, go to Notifications > Add-on Licenses to see the list of add-ons that are installed and activated on your site. Once here, enter the license keys for your add-ons from your original purchase email from the Better Notifications for WordPress Add-on Store. If you can’t find your original email, you can find your license keys under the Your License Keys section of Your Account. After you’ve added all your license keys, make sure you press the ‘Save License’ button. After the page has refreshed you can tell if a license key has been successfully activated as it will show a ‘Deactivate License’ button to the right of the license key. Should you ever wish to use your license key on another site, you’ll need to deactivate your license on the site you wish to remove first, and then re-activate it on the other website. You can do this via the Notifications > Add-on Licenses screen, or via the Your License Keys section of Your Account. License activation limits apply depending on which license(s) you have purchased or subscribed to.